Kenneth Anton was born in the United States and having lived in many countries maintains an international perspective in his writings. Born a skeptic, he questions: Who is behind the New World Order? How can the mainstream media speak with one voice? Why have cancer treatments been such an abysmal failure over the past several decades despite the half trillion dollars dedicated to its eradication? Not afraid to tackle sensitive topics and outright conspiracies, he explores subjects which are commonly considered taboo. As a researcher and investigator, he encourages his readers to question and analyze. In his own words, “Knowledge does not come gift-wrapped in a box but must be sought after with perseverance and an undying desire to seek the truth. History is saturated with conspiracies and tragedies due to the inherent nature of man. He who does not bother to study history or ignores the reality of secret conspiracies like the New World Order is doomed to suffer the consequences." Dedicated to Americans who demand a totally new healthcare system designed from the ground up to actually improve healthcare and cure major diseases at a reasonable cost, not one run from the top down by an oligarchy seeking increased profits. The Medical Cartel has grown into an enormous bureaucracy comprising doctors, hospitals, support services and government regulators like the FDA, and CDC, all working closely with Big Pharma to ensure its ludicrous profits. Despite the efforts of the cartel to suppress natural therapies, many have succeeded in actually curing cancer so that patients can resume a normal life. Juxtaposing these therapies against orthodox therapy is the focus of the book which also includes three dramatic stories about couples who struggle against cancer. As far as the 'War on Cancer', even with the hundreds of billions thrown at it, the survival rate shows minimal improvement over the past 40 years and they've given up finding a cure because the real money is made in treating cancer. Other noteworthy topics presented are the AMA, FDA, Fluoridation, Vaccination, Obamacare fiasco and systemic fraud and corruption in the Medical Industry, each pertinent in today's troubling environment. With the passage of the Federal Reserve Act of 1913 by a corrupt Congress, the concentration of wealth into a few select hands enabled the gradual transformation of the United States into a Fascist state. Over a century, the elite bankers in league with the largest corporations have gained control of the government and acquired 90% of the mainstream media which they use to manipulate the public's perception of reality and further their agenda. 2013 will witness increasing confrontations by the Federal Government against innocent citizens and peaceful protesters, intensifying surveillance, spurious arrests and gun confiscation, all this supposedly justified under the Patriot Act and the NDAA 2012. Employing a militarized Police force, Homeland 'State Security', has started to implement a police state to be ruled by a tyrannical dictator. 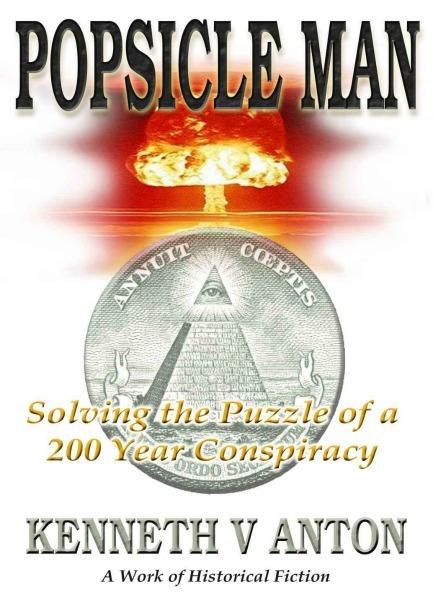 Popsicle Man depicts such a sequence of cataclysmic events and how the characters within this political thriller take action to try and change the course of history.